The fact that the usual suspects responded in the usual ways to President Trump’s State of the Union speech does not make their analyses wrong – it just makes them predictable, and thus a less useful barometer for how the speech played outside the NYC-DC pundit beltway. Initial polling by CBS suggests that it was received relatively favorably by those who watched it – fully 75% of respondents “approved” of the speech – although it is worth remembering that audiences for these speeches are a self-selected group – something I was reminded of at my weekly politics luncheon yesterday when almost all of my “senior” (and left-leaning) students informed me they had no intention of watching Trump’s address. In this vein according to CBS, only a quarter of those they surveyed identified as Democrats – presumably they made up the bulk of those who disapproved. (My current undergraduates, on the other hand, promised that they would watch the speech – cue surprise quiz!) It is not clear as yet how large the television audience was, but for what it is worth Twitter reported that, fittingly, the Tweeter-in-Chief’s speech was the most tweeted about State of the Union speech to date. Focus groups also reacted in a somewhat positive manner to the speech, although sentiments were by no means uniform. Of course, public opinion may shift during the next few days in response to how the speech is characterized by cable news talking heads and other pundits. If a dominant theme or characterization of Trump’s speech takes hold, it can alter public perceptions at the margins. If there is anything pundits might agree on, it is that Trump’s speech was long – one of the longest such speeches in history, according to some sources, clocking in at about an hour and 20 minutes, or only slightly shorter than Bill Clinton’s 2000 SOTU. Surprisingly – at least to some – he appeared to stay on script, more or less, although at times he seemed to dare Democrats in the audience to take issue with what he was saying. For the most part, however, they were content to sit on their hands and glower, with the exception of some scattered booing when Trump purported to explain what “chain migration” meant. Who knows how he might have reacted had a Democrat accused him of lying, for example? Perhaps we should not have been surprised by his restraint; as I reminded my hosts in my pre-speech interview with KCBS radio when they asked me whether Trump would go off script, he proved quite disciplined in his first address to a joint session of Congress last year. So there was precedent for him to recognize and rise to the gravity of the moment, and to resist giving in to his coarser, bullying twitter-driven persona. Moreover, his delivery last night was relatively smooth and somewhat understated, with little of the nasal snorting that occasionally mars his public addresses. For the most part, he directed his remarks toward his left, where the Republican majority sat, and only turned right when he expected Democrats to respond positively to something he was saying. Republicans, in turn, reacted in a quite favorable – at times almost giddy – manner, standing and wildly applauding at all of the scripted moments, and for some unscripted ones as well judging by Trump’s evident surprise at their response. As far as one can judge from audience reactions, this speech was a huge hit with them, which of course made Democrats glower all the more. While some critics noted the lack of detail in his discussion of policy, particularly in reference to his call for legislation totalling $1.5 trillion in spending on infrastructure, Trump correctly recognized that State of the Union addresses are best remembered for the thematic chords they strike, and the degree to which those chords are in harmony with broader public opinion. It is not a time for spelling out proposed legislation in detail. Consistent with that approach, he made frequent, and for the most part, very effective use of his invited guests in order to illustrate broader themes and related issues, ranging from parents of victims of the MS-13 gang, a victim fleeing North Korean persecution, military veterans, an Immigration and Customs Enforcement agent, first responders to hurricanes and wildfires, and business owners and employees benefiting from Trump’s tax legislation. Indeed, the story of Ji Seong-ho, the defector who lost limbs while struggling to survive under the North Korean regime, and who responded to Trump’s shout out by raising his crutches as a symbol of what he endured, was perhaps the most emotional tribute during the entire night. “It was that same yearning for freedom that nearly 250 years ago gave birth to a special place called America. It was a small cluster of colonies caught between a great ocean and a vast wilderness. But it was home to an incredible people with a revolutionary idea: that they could rule themselves. That they could chart their own destiny. And that, together, they could light up the world. For Trump, America endures because Americans have been willing to pay an often steep price to insure its survival. It is no surprise, then, that his guests were individuals who succeeded, or at least soldiered on, despite enduring great hardship – even personal tragedy. To his critics, of course, Trump’s vision is that of a bygone era; he seeks a return to a largely white America dating to the 1950’s, or before – one that has little place for people of color or immigrants from “sh*thole” countries. For his supporters, however, Trump’s America is one that transcends divisions based on race, ethnicity or other elements of identity politics – it is a place that focuses on the ideals we have always shared, rather than on what sets us apart. I suspect last night’s speech, while generally effectively delivered, did little to change those competing perspectives. The centerpiece of Trump’s speech, however, was his four-point immigration plan. On paper, it has something to appeal to both Democrats, with the path to citizenship for anyone qualifying for “Dreamer” status, and to Republicans, with the call for strong border security and a slowing in immigration levels and a movement toward skills-based entrance standards. However, early indications are that it is meeting the same headwinds emanating from the extremes of both congressional caucuses that doomed previous immigration legislation. If Trump can get major immigration legislation through Congress without enduring another government shutdown, it will be huge accomplishment, transcending even the tax bill in terms of significance. But that is a big “if”, and as I told WCAX’s Darren Perron earlier this month, I’m not optimistic. 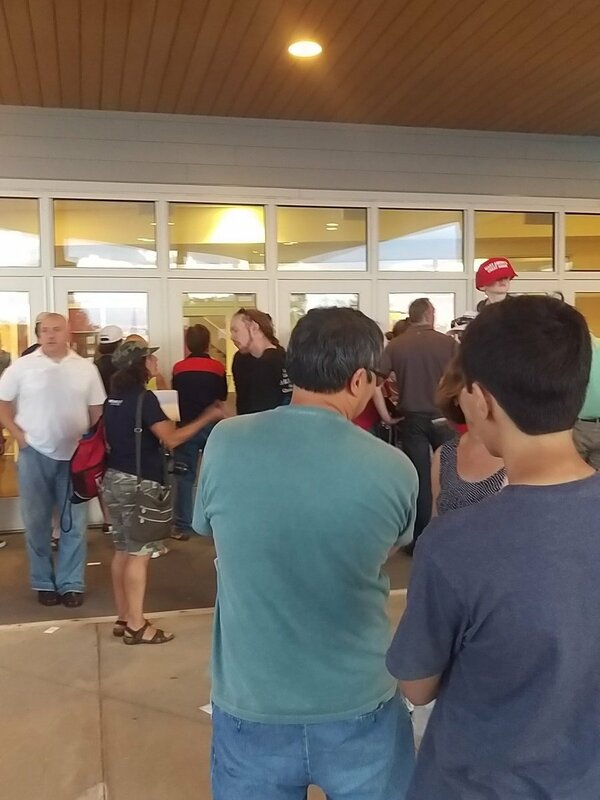 Last Saturday I attended a Trump rally in Windham, New Hampshire – a relatively affluent town (median income was $127,868 in 2014) of just under of 15,000 people located in the southern portion of the Granite State. Regular readers will know that I’ve attended several Trump rallies, but this was the first one since I was at Trump’s coronation in Cleveland, and I was eager to see whether he was attracting new supporters and, if so, what they saw in him. I’ve learned through experience that the reasons Trump supporters give for backing him often bear scant resemblance to what the twits on my twitterfeed tell me is really motivating Trump voters. The experience provided a fascinating window into the minds of Trump supporters. 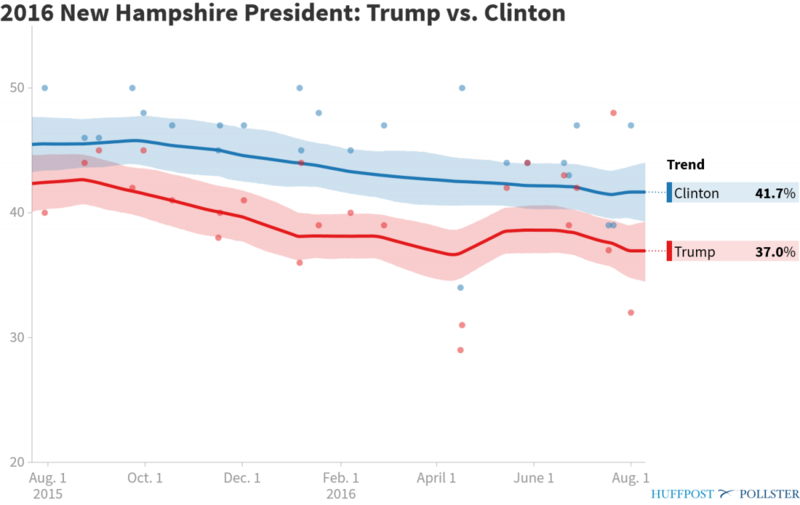 New Hampshire is considered to be a battleground state, with the latest Huffpost polling aggregator giving Clinton almost a 5% lead. 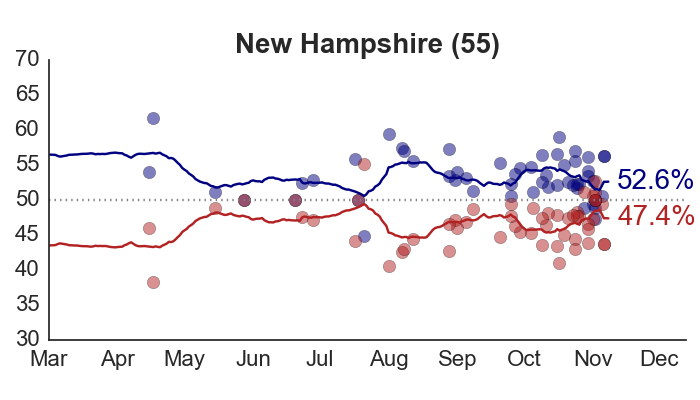 Drew Linzer’s poll tracker, which uses a slightly different algorithm, gives Clinton a 7% lead in New Hampshire. I consciously sought to talk with about an even mix of men and women (there were not a lot of racial or ethnic minorities in the crowd that I could see). I have found that if I make it clear that I am a political scientist doing research (I show them my business card), and not a member of the media, people at these rallies are only too glad to talk to me, and in great depth. I began by asking them if they were supporting Trump, and if so, why. From there I probed more deeply, asking about the previous candidates they may have supported, what they thought of Trump’s stances on issues and his qualifications for office, and how strongly they were committed to voting for him. As much as possible, however, I let them take charge of the conversation. My goal was to elicit a more thorough understanding of what they thought of Trump than one can get through the more fixed interview protocol used in surveys. It quickly became clear that two themes dominated the thinking of Trump supporters. The first, expressed – unprompted by me – by every person I talked to, was economic anxiety. Interestingly, that anxiety was not directed so much at their own situation but toward that of their children, or others close to them. One women, in her forties, got emotional as she told me her daughter and son-in-law were about to have twins. “They work so very hard,” she said, “and yet they aren’t getting ahead.” A second woman, who appeared to be in her early thirties, and who is a nurse, said students graduating from nursing school today are starting at salaries $10 lower than what she earned starting out a decade earlier. “That’s not enough to pay off their loans,” she observed. She said she had been an Obama supporter, in part because she backed Obamacare, but she now thought the health care law was a disaster for both providers and consumers. A third woman told me she was a first-generation immigrant who was attracted to Trump because she believed in capitalism. “I’ve lived under socialism,” she told me. “I want capitalism.” Like many of the people I talked to, she liked Trump because of his business background, and his lack of political experience, both of which she saw as virtues. When I pushed these people to explain how they thought Trump could speed up the slow economic growth they associated with the Obama presidency, the common response was some variation of, “I don’t know, but we have to try something new.” Others responded by noting that “it can’t get any worse” under a Trump presidency. One man, who appeared in his mid-forties, recounted a conversation he had with business associates on this topic: “They told me that if it requires blowing up the existing system to get meaningful change, it has to be done.” Here is where I saw how Trump’s lack of political finesse worked in his favor among these voters – something that’s hard to see based on the more critical coverage he gets on cable news and social media. The second theme that emerged, again unprompted by me, was a deep antipathy toward Hillary Clinton. One man, in his early 40’s, told me he wasn’t voting for Trump as much as he was against Clinton. Almost to a person those I talked to expressed a fundamental belief that she could not be trusted. At one point in our conversation, the woman whose daughter is having twins lowered her voice to tell me, “I’m a Roman Catholic and a good Christian, but I just have to say this: that woman [Hillary Clinton] is evil.” When I pressed several of them to compare her knowledge on issues like foreign policy to Trump’s, they pushed back against the idea that she was somehow more qualified than him. One man visibly recoiled when I suggested she might be, on paper, better prepared to serve as commander-in-chief. “You can’t believe a word she says!” he replied incredulously. As I’ve noted in previous posts, despite fact-checking statistics that seem to show Clinton’s statements are more often factually correct than are Trump’s, there is a deep and abiding perception among a good portion of the population that Clinton is simply not trustworthy. Some of that mistrust, according to those at the NH Trump rally, goes back to events occurring under Bill’s watch. People I talked to often referenced the two of them together. Many of the people I interviewed did not start out as Trump supporters. Several were originally Kasich or Rubio backers, but most said they were now supporting Trump. One Kasich supporter who was now voting for Trump said he couldn’t bring himself to vote for Clinton. One woman, who appeared in her early 20’s, said she had read Trump’s book The Art of the Deal when she was a teenager, and it had inspired her to go into real estate. “I’ve always admired him,” she acknowledged. I interviewed only one person, a young woman who appeared to be in her twenties, who said she was not voting for Trump. “I was just curious to see a Trump rally,” she told me. When pressed, she told me she was voting for Clinton, but not because she supported her, but because “she is a Democrat. I’m voting for the Party.” As I noted above, at about the mid-point of Trump’s speech, spectators began trickling out complaining about the oppressive heat inside the building. Unfortunately for some of them, the Trump supporters outside the building thought they were protestors getting tossed from the premises, and their appearance sometimes incited boos and heckling from the crowd. Throughout Trump’s speech, those outside periodically erupted into chants of “Trump, Trump, Trump!”, “Build that Wall!” and “Lock her up!” One of the more imaginative chants was started by a Trump supporter who said, “Everyone talks about Trump and 1984” – apparently referencing Orwell’s classic book about authoritarian rule. “Well, I have a better date: 1789!” Whereupon people began chanting, “1789! 1789!” As one who teaches the intro course on American politics, I felt a certain pride in this particular chant. 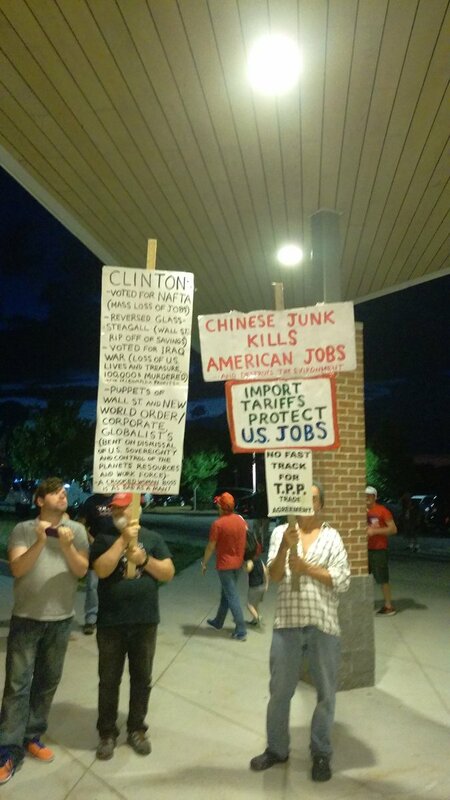 Granted, this was a rally in New Hampshire, and it may not be representative of what Trump supporters elsewhere believe. But the deep concern about the economic future of the country is something I’ve heard from Trump supporters at other rallies I’ve attended as well. As one Trump supporter in New Hampshire explained to me, “These people still believe in the American Dream about getting ahead, but they they think it is slipping away from us.” The other aspect of the interviews that stuck with me is how thoughtful those I talked with were when giving their responses. It was clear they were knowledgeable about the candidates and the issues, and that their support was based on a careful consideration of both. Of course, I don’t doubt that there were the occasional conspiracy theorists sprinkled in Trump’s crowd as well. But on the whole this clearly wasn’t a rally of the brown-shirted thugs that social media often makes Trump’s supporters out to be. Trump has clearly tapped into a genuine feeling of economic anxiety among a significant number of voters. Whether that will be enough to propel him to the presidency remains to be seen. But it is a feeling that Clinton and her supporters would do well to take seriously. Addendum 4:19 8/11/16: This Wall St. Journal article on the impact of Chinese imports on New Hampshire towns and communities in other states dovetails exactly with what Trump supporters were telling me at his rally on Saturday. What I Saw in Cleveland: Trump Rocked, But Can He Roll? The measure of an effective convention is the size and durability of the boost (if any) it produces in the nominee’s support. 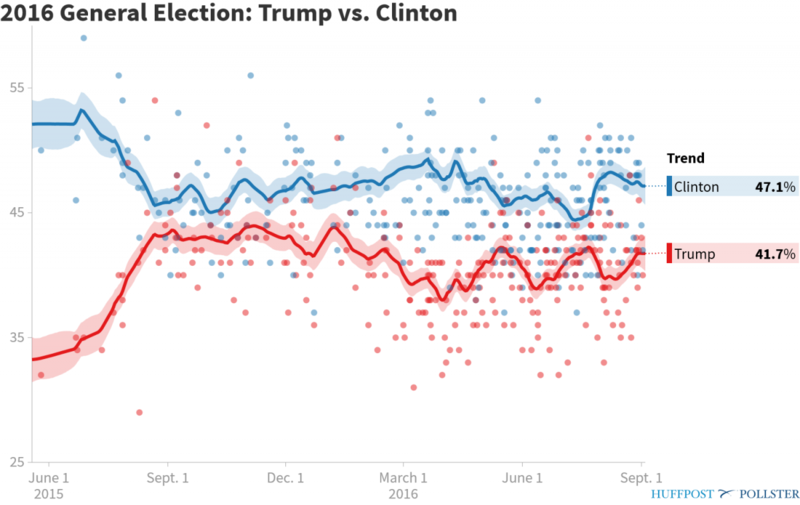 Early polling results suggests Donald Trump may have received a small boost in his support from the recently-concluded Republican convention, mostly from previously undecided Republicans, but it’s still too early to judge whether, and how much, it improved his chances in November. This hasn’t stopped pundits on both sides of the political aisle from rendering their own verdict, however premature, of course. Here’s my take, based on my brief time in Cleveland, capped by a ringside seat (if sitting in the nosebleed seats counts as ringside) to watch Trump’s lengthy, and loud, acceptance speech. The goal of any party convention is to unify the party behind the presumptive nominee, and to articulate the major themes on which the candidate will run in the general election. For the most part, I thought Trump accomplished these objectives. I flew into Ohio expecting to see a very divided set of Republican delegates, and braced for major demonstrations in the streets. Neither expectation was met. In fact, despite the media’s tendency to focus attention on dissenting delegates and other controversies (see coverage of Melania’s partly plagiarized speech), this was a relatively tame event. Once Trump’s team, allied with the Republican Party leadership, beat back an early effort to amend the rules to allow the delegates to vote their conscience, the battle for the nomination was essentially over. The state roll call on Tuesday went relatively smoothly, with New York’s delegates, as announced by Trump’s son Donald, putting Trump over the top to become the party nominee. Similarly, while Ted Cruz’ failure to endorse Trump received a lot of airtime on the cable shows, it wasn’t clear to me (I wasn’t in the arena for this) that it played all that well with most delegates. In my view, Cruz’ decision not to endorse was made with an eye toward his bid for the presidency in 2020, on the assumption that he won’t be tainted when Trump is defeated come November. I suspect it will have little impact on the 2016 race. Perhaps equally surprising, I saw little evidence of sustained protests against Trump on the streets. 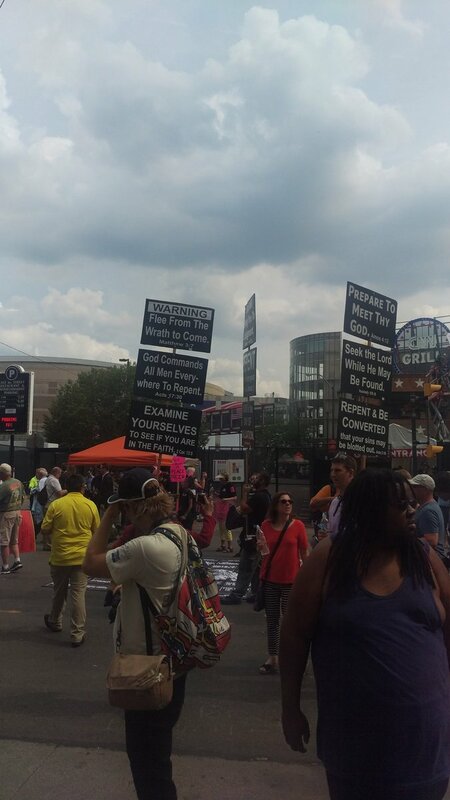 To be sure, there were organized demonstrations held nightly at the public square a short distance from the Quickens Loans Arena, but they were largely peaceful and mostly out of site to delegates entering the arena. Perhaps the most boisterous opposition I saw was by religious groups that evidently viewed Trump’s candidacy as a harbinger of a coming apocalypse. 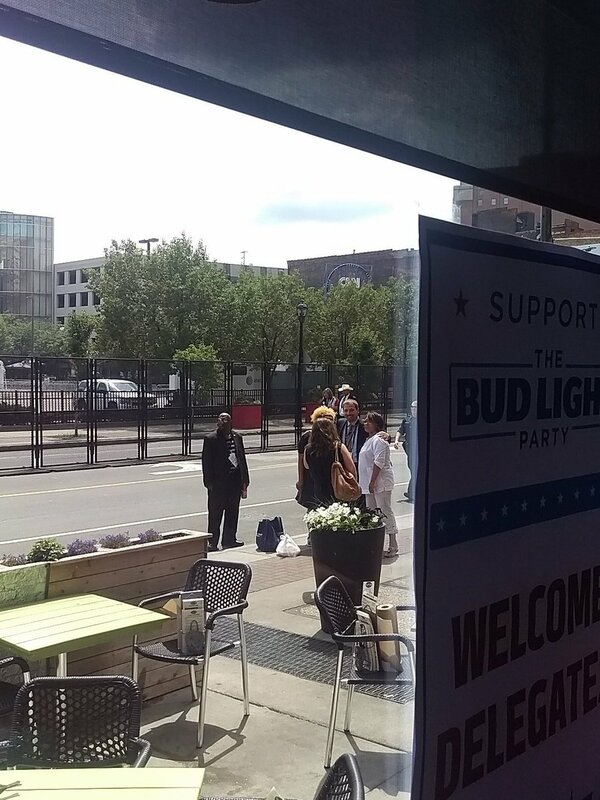 There was an incident in which a protester tried to burn an American flag near the convention arena entrance, but according to the waitress I talked to in Flannery’s Irish Pub who saw the event, he wasn’t even able to ignite the flag – but did ignite himself – before police wrestled him down. Protests that same night led to maybe two dozen arrests. The next day security was significantly beefed up in that area, including the use of mounted police, and I didn’t see any significant protests as I entered the arena that night. 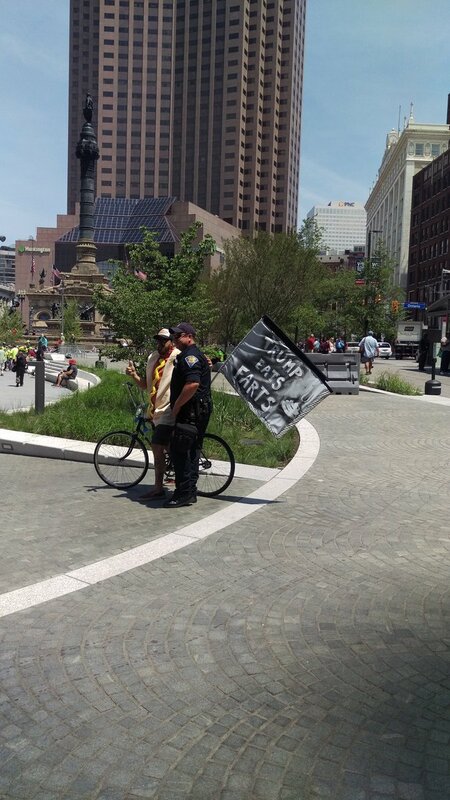 On the whole, this man holding a sign proclaiming that “Trump eats farts” while posing for pictures with one of Cleveland’s finest pretty much sums up the tenor of the protests that I saw in Cleveland. 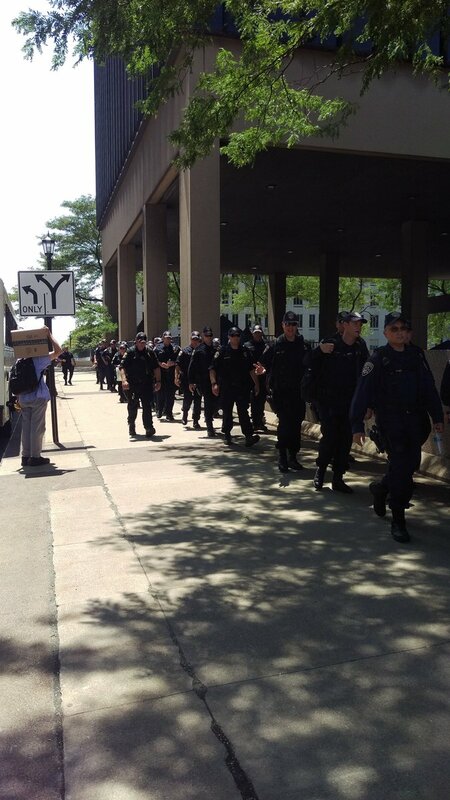 It may be that the highly visible security presence deterred more violent protests. Indeed, security was tight all over. As I headed to the courthouse to pick up my security clearance, a platoon of some 40 or more officers came sprinting by me. 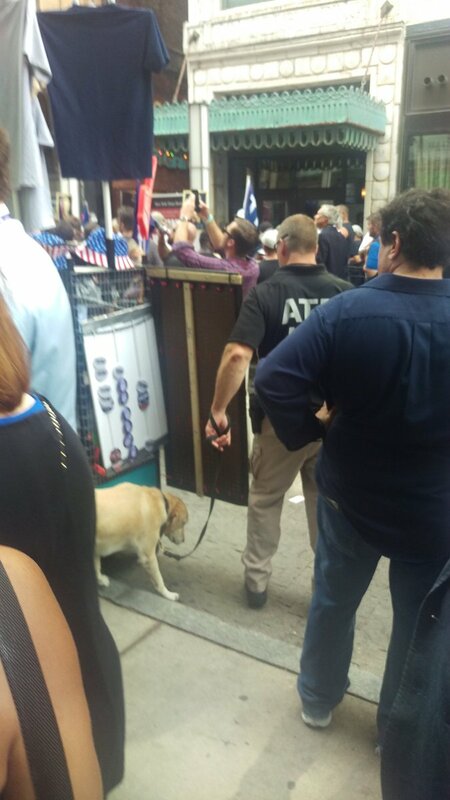 There were uniformed officers and security in riot gear holding weaponry everywhere, and police used bomb-sniffing dogs to check for explosives in packages on the street. To get into the security perimeter around the arena one had to pass an extensive security check, which was more thorough than anything I’ve gone through to get onto an airplane. That included turning on smart phones to prove they were real. For the most part, the process went very quickly, but it made me reconsider how much time I wanted to spend in the arena, since I didn’t look forward to going through security every time I had to reenter. Security was a bit less stringent at the convention center a couple of blocks away from the arena, where the print media (of which I was, allegedly, one) were penned up to write their copy. Evidently we weren’t considered high priority targets for terrorists. Rather than spending time in my designated space with the international media in the far corner of the print press room, my wife – er, camerawoman – and I staked out a position in a pub just opposite the arena entrance where I could drink some local beer, send the occasional tweet, and watch the talking heads like Meet the Press’ Chuck Todd interact with the little people. It was a taxing assignment, but someone has to speak truth to power. 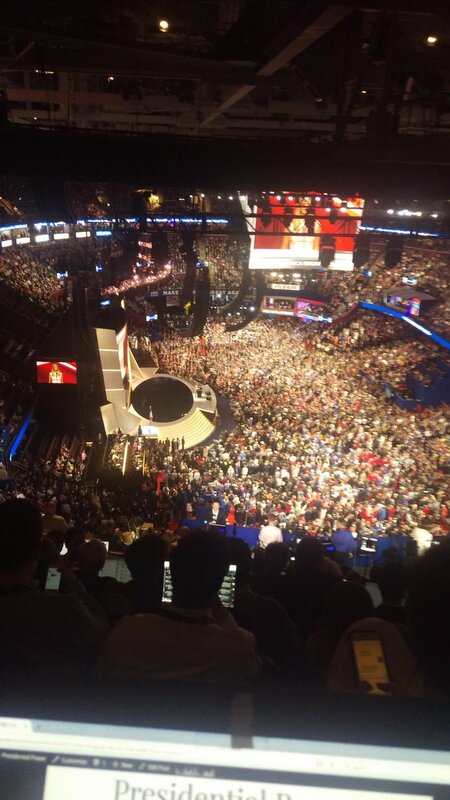 On the final night of the convention, I decided to watch the proceedings from the highest point in the Quicken Loan arena seats, to the left of the main stage, about level with the balloons clustered on the arena ceiling. (My media credentials limited me to the upper balcony seating.) 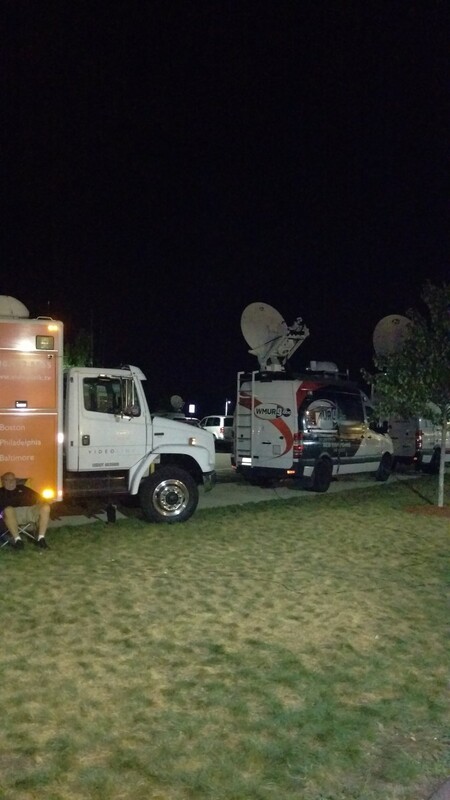 On the way in I saw a gaggle of reporters surrounding someone who I assumed must be very important. 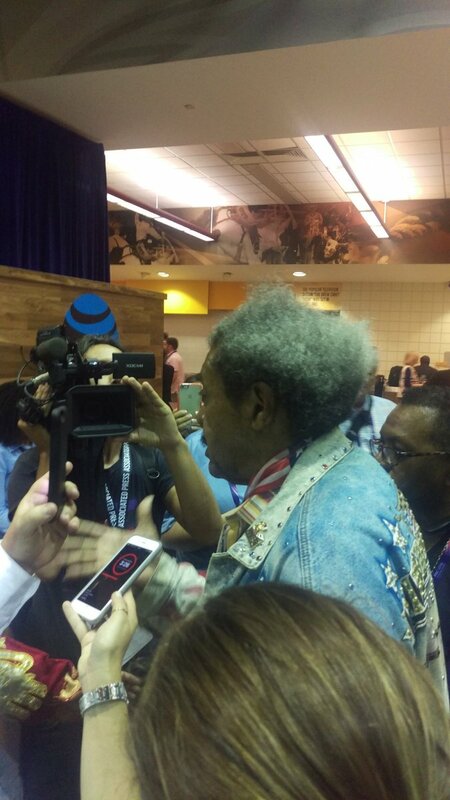 It was Don King, the boxing promoter. He had missed out on snaring a formal speaking slot, but that didn’t stop him from talking. From my nosebleed seats the speakers seem quite tiny, but I had a fine view of the proceedings via the overhead screen. The most anticipated speaker of the night, other than Donald, was his daughter Ivanka, and she delivered, both substantively and in presentation. To the extent that her comments on issues like equal pay and child care reflects her father’s views, it is a reminder of how Trump is willing, in some areas, to go against the Republican Party orthodoxy in a bid to reach out to more moderate voters. Whether he succeeded is another question altogether. When Ivanka introduced her father, the place erupted in applause and a glow of camera phone flashes as Donald walked on stage, his hair looking less unruly than usual. Even though I was about as far from Trump as one could be, I’m pretty sure I could have heard his speech even had there been no amplification – he practically shouted it out, which may have been partly a function of his adjusting to using a teleprompter, rather than the more informal speaking style I’ve seen from him at his rallies. As I watched the speech, one incident in particular stood out as a testament to Trump’s maturation as a candidate. 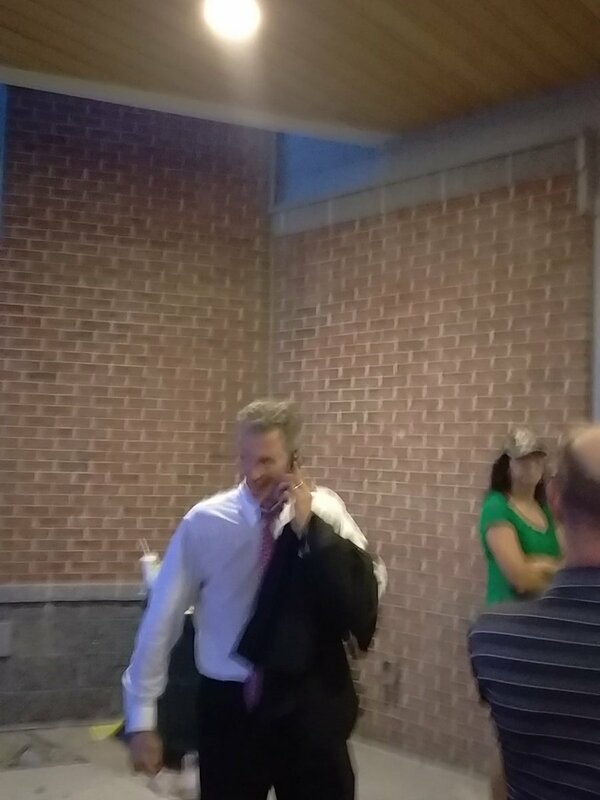 As security quickly surrounded the lone protestor who tried to disrupt the speech, Trump refrained from issuing his characteristic order to “Throw him out” which I had seen so often on the campaign trail and instead, after the protestor was gone, took the time – to great applause – to praise law enforcement for their hard work without ever directly referencing the disruption. So, what impact will the convention, and Trump’s speech, have on the presidential race? My sense is that, despite the media focus on a “divided party,” Trump accomplished his first objective, which was to unify the Republican Party behind his candidacy. (Contrary to the impression the media conveyed, when I heard delegates chanting “Lock her up” in reference to Hillary Clinton, it sounded less like an angry mob and much more like a rollicking party. Delegates were having fun with the chant – or so it seemed to me inside the arena.) And I think his message will resonate with that portion of the electorate that has experienced years of stagnant wages, and who are worried about growing economic inequality and security issues. But although he modified his stance on immigration to target countries rather than Muslims, and made a direct appeal on Thursday night to the groups, including African-Americans, Latinos and members of the LGBT community that historically vote Democrat, it is not clear to me how effective he was in expanding his electoral coalition beyond his current base of low-to-middle-income mostly white male voters. And I am skeptical that he will be very successful in peeling off very many Sanders supporters to join his cause, despite his direct effort to reach out to them in his speech. But won’t stop him from trying, as evidenced by today’s twitterfest from Trump decrying the DNC email scandal. The other unknown, of course, is how much of a boost Hillary Clinton will get when the spotlight turns to the Democratic convention in Philadelphia this week. Ironically, despite all the media buildup anticipating a very divisive Republican convention, it is the Democrats who seem more divided at the moment, at least if the Sandersistas follow through on their pledge to bring 100,000 protestors to the City of Brotherly Love. 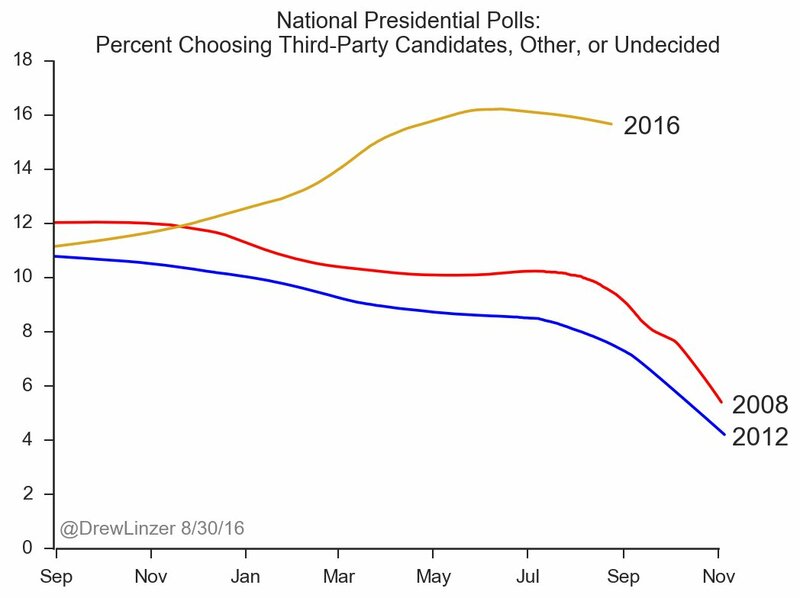 My guess, however, is that Democrats will leave Philadelphia next Thursday more unified than they appear to be now, just as Republicans did. Let me conclude by repeating what I told the camera crew from the Cleveland visitors bureau when they interviewed me about what I thought about their fair city: everywhere we went people were incredibly nice and helpful, whether it was the man on the rapid transit train explaining how to get to downtown Cleveland, the judicial clerk who sent me to the correct courthouse to get my security pass, or the rapid transit official who let me jump the turnstile when I lost my farecard. I know Cleveland gets a bad rap – burning rivers, Lebron James, Lebron James again, etc. (City Motto: We’re not Detroit!) But from what I saw in the brief time I spent there, Cleveland Rocks. Does Trump Have His Eye On Newt? We have entered a political lull between the period in which Donald Trump and Hillary Clinton became their party’s presumptive nominees and the party conventions signifying the kickoff to the general election campaign. In a bid to drum up items of interest during this slow news period, the media will spend an inordinate amount of time speculating about who the two candidates will choose as their vice presidential running mates (along with a healthy dose of Clinton’s email woes) – an exercise that both candidates will be only to happy to encourage. These stories will contain the obligatory reference to John Nance Garner’s quip that the Vice Presidency is not “worth a bucket of warm piss”, and then will play the speculation game by pointing out the ways in which various potential candidates do or do not help the president win the general election. We’ll see references to which vice presidential candidate best “balances” the ticket – geographically, or with certain voting blocs (women, religious groups, etc. ), or to compensate for a candidate’s perceived lack of expertise in certain areas. At first glance, former House Speaker Newt Gingrich, who is reportedly the front-runner to become Trump’s running mate, seems to provide the type of congressional experience that Trump will sorely need if he’s to get his legislative agenda through Congress. Even Gingrich’s harshest critics acknowledge that he is smart, and a savvy player of the Washington game. But Gingrich has also acquired a reputation for erratic behavior and a penchant for floating big think, but perhaps impractical ideas – see his proposal during the 2012 campaign for establishing a moon base by 2020. More importantly, perhaps, Gingrich seems to suffer from some of the same weaknesses Trump exhibits – a lack of self-discipline and a penchant for rhetorical excess that often attracts media attention for the wrong reasons. And his personal life – particular his marriages – isn’t likely to sit well with conservative voters who are already suspicious of Trump’s right-wing credentials and moral rectitude. Electorally, it is not clear that Gingrich brings much to the ticket. It is true that Gingrich won his home state of Georgia easily four years earlier during the race for the Republican nomination, which might matter if Democrats try to turn that state blue – a long-shot proposition at this point. However, there are lots of more important swing states out there (see: Ohio) and politicians (see: John Kasich) who would make a better choice for electoral reasons alone. The problem, however, is that many of the Republicans who bring the most electorally, including Kasich, Tennessee Senator Bob Corker and Iowa Senator Joni Ernst, have expressed no interest in being Trump’s running mate. Gingrich, on the other hand, seems perfectly willing to climb aboard the Trump presidential train. One important quality that Gingrich does possess, at least according to press reports, is that Trump likes and trusts him, something that is evident in Trump’s comments about Newt during their joint appearance at a rally yesterday in Cincinnati. Who knows? A Trump-Gingrich presidential ticket might create the type of creative synergy not seen since….well, since ever. Or, the two might create a combustible mix of inflated egos and excessive rhetoric that will end up self-destructing on the campaign trail. Either way, it would be one hell of a ride.